A year later the group went on to create a major exhibit at the Minneapolis Institute of Art’s Minnesota Artist Exhibition Program (MAEP), “Frontera Lake Street”, which showcased the work of six local Latino artists. A highly attended exhibit, “Frontera Lake Street”, generated both publicity and critical acclaim. And it brought color and passion, politics and spirit to the Minnesota art world. In 2002, Grupo Soap created a Dia de los Muertos (Day of the Dead) exhibition and celebration, “Un Dia con los Muertos en Lake Street“. The exhibit focused on nine 8’x12’ murals on the Lake Street side of the empty Minneapolis Sears building, an ofrenda for the dead nearby, performance/ritual by local Aztec dancers, and a party/celebration at alternative Latino institution ArTrujillo Gallery/Studios. For Dia de los Muertos 2003, Grupo Soap spotlighted the 370 plus disappeared and murdered women of Juarez, Mexico, with an exhibit and installation, “Ni Una Mas” (“Not One More”). It again added performance, music and food to the show, which took place at Mira Gallery/El Instituto de Cultura y Educación at El Colegio in south Minneapolis. In 2004, the artists of Grupo Soap del Corazón joined forces with Highpoint Center for Printmaking to create a workshop on silk-screening and an exhibition, “Gráfica Politica”, that exhibited both Minneapolis and Chicago artists. The prints made in “Gráfica Politica” were entered later that year in a community wide group show at the Minneapolis Institute of Art, entitled “The Art of Democracy”. In 2005, Grupo Soap mounted two exhibitions in Valparaiso, Chile. The first show, “El Otro Americano” (“The Other American”), took place at El Instituto Chileno Norteamericano de Cultura and described the Latino–American experience. The second show, “Politica Ex-Carcel”, took place at Centro Cultural Ex-Carcel, a former prison under the Chilean dictator Augusto Pinochet. In that exhibit, Grupo Soap del Corazón artists joined the long history of Latino political artists by stenciling/photographing posters on the walls of neighborhoods and barrios in Minneapolis, St. Paul, and Valparaiso, Chile. 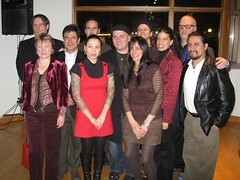 In 2006 Grupo Soap del Corazón created “Artsourcing, An International Consortium of Outsourcing Artists” at The Soap Factory in Minneapolis. In that exhibit Grupo Soap, by publicly outsourcing the labor for all the individual projects, confronted issues of globalization and capitalism as they pertain to Latin America and the United States. By highlighting the work of those that actually do the manufacturing, Grupo Soap brought a measure of honor, recognition and profit to the almost 100 workers, from Tijuana, Mexico, to West Saint Paul, Minnesota, that participated. Finally, in the fall of 2006, Grupo Soap del Corazon joined with ArtOrg, a Northfield, Minnesota based arts non-profit, to create “Northfield Dia de los Muertos”, celebration that joined together the resident Anglo community of this college town with recent Mexican immigrant factory workers. The event evolved around a 104’ banner printed with a steamroller on 4’x8’ woodblock prints created with Day of the Dead themes by a group of 14 Latino artists from Northfield and the Twin Cities. Additionally, paper prints were made of those woodblocks and exhibited in a show at ArtOrg’s Moving Walls Gallery. Later that year, Grupo Soap and ArtOrg brought those same 4’x8’ prints on paper to an exhibition, “Northfield Muertos”, at the California Building Gallery in Northeast Minneapolis. In 2007 Grupo Soap del Corazón partnered with Art Jones Gallery to create “Nuestra Frida”, a response to the exhibition “Frida Kahlo” at the Walker Art Center in Minneapolis. For our “Frida”, Grupo artists created a magnificent show of painting, photography, installation, sculpture, drawing, and performance that was attended by well over 1000 people during it’s run. It added a panel discussion on Frida Kahlo with the curator form the Walker and several academics and an artist that was attended by almost 100 people. For 2008, Grupo Soap took to the streets of Minneapolis and St. Paul with “Grafica Politica #2”. For this art intervention, artists from around the world sent political poster art to the Twin Cities to be displayed on telephone poles and buildings and fences around town during the Republican National Convention. Thus, an artist team in New Zealand, an artist from NYC, an artist from St. Paul – all had the opportunity to expose their thoughts the community during an intense week of civic participation in the American civic process. For 2009, Grupo Soap once again partnered with ArtOrg from Northfield, Minnesota, and created 4’x8’ steam roller prints to celebrate Dia de los Muertos. This time the printing was sponsored by and took place at the Plains Museum in Fargo, North Dakota. It was followed by a group exhibition of the work and opening celebration at the Museum. 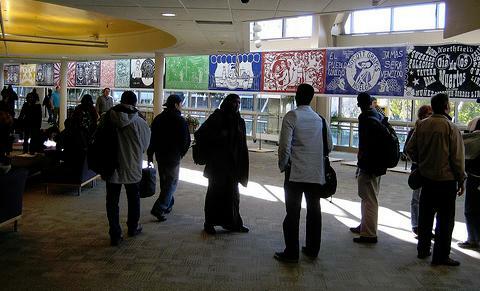 In 2010, Grupo Soap participated in a number of exhibitions, including shows of the Northfield and Fargo steamroller prints at St. Olaf and colleges. Grupo Soap del Corazón also participated in the Minneapolis Monarch Festival, assisting ArtOrg in doing steamroller printing for almost 300 kids at Lake Nokomis in South Minneapolis. In 2011 in celebration of its 11th year anniversary, we stayed true to it’s purpose: to encourage and exhibit “Soap del Corazón”, art that cleans the heart. It has showcased the work of 50+ artists. Well over 100,000 people have seen its art. It has pulled the people of Minneapolis – St. Paul and Minnesota into deeper community. So, in celebration, Grupo Soap will create an exhibition at Intermedia Arts in South Minneapolis the summer of 2011 entitled “El Milagro ”. “El Milagro” (The Miracle) will address the religious, mystical, cultural, political, psychological and historical nature of miracles and the miraculous, especially amongst Latin Americans. In 2012 Grupo Soap del Corazón will opened with a show at the new Franconia in the City @ Casket Gallery in Northeast Minneapolis. “Los Cuatro Ases” (The Four Aces) and featured two- and three-dimensional art by four well known international artist members: Alonso Sierralta (Chile), Peter Martín Morales (Guatemala), Douglas Padilla (Minnesota), and Xavier Tavera (Mexico). For the show Padilla, who is primarily a painter, and Tavera, who is primarily a photographer, joined Morales and Sierralta, both primarily sculptors, in creating two- and three-dimensional art.